Thirty-nine members made their way to the Lads’ Club early on May 12th to enjoy breakfast before the start of the meeting. And what a delicious breakfast it was. 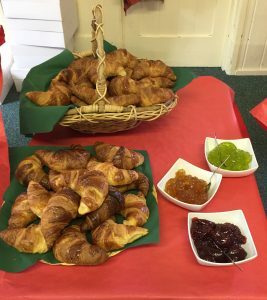 Fruit juice, cereals, and melon to start followed by croissants, ham, cheese, and a selection of breads. 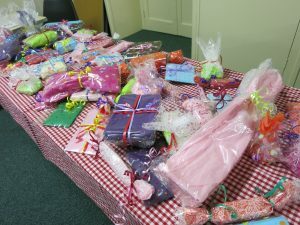 The Birthday presents looked splendid in their lovely wrappings and proved very popular with members who squeezed, rattled and sniffed before making their choice. Thanks to Jackie for all her hard work sourcing and making the presents look so appealing. In fact our thanks go to the committee for all their hard work in once again making the Birthday Breakfast so enjoyable. At 10am we were joined by six more members and Vice-president Jeanne Doorne called us all to order. Members were reminded of the change of date for the Pot Luck Lunch which will now be held on July 28th. Click on the link 2017 programme to see all our meeting dates. 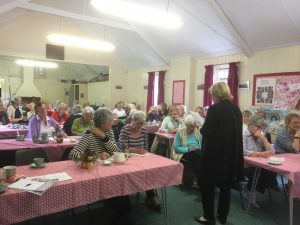 On April 25th Castle Green hosted a very successful Group Meeting. Click on the link Past Events to read a report on that meeting. On September 28th, there will be an outing to the Royal Albert Hall . For further details Click on the link Outings. Next on the agenda was discussing and voting on the two resolutions to be put forward to the national Annual Meeting – Alleviating Loneliness and Plastic Soup – keep Micro Plastic Fibres out of our oceans. Jeanne Doorne led us through the first and Kate Dilks the second. After discussion members voted in favour of both resolutions. Jeanne then introduced our speakers, John Sinclair-Thomas, Helen Molyneux, Sheila Willis and Anne Mayne who spoke about Dementia Friends and Making Hythe Alzheimer Friendly. This was a challenging and thought provoking talk and gave us an insight into the work being done locally and perhaps changed our perceptions of dementia. Jackie Vickerman gave the vote of thanks.